It's day three of A-Z and I'm continuing my theme of blogging tips. Today we'll be talking about comments. Later in the month I'll be focusing on how to get comments, but today is about making it easier for people to leave you a comment. 1. Blogger has an awesome spam filter. Taking off your CAPTCHA will not fill your comments with spam. Trust me, I've had mine off for years. 2. I often won't leave a comment if you have this box. I'm not going to try to fill it out more than once. Also, if I see this while I'm visiting your blog from my phone, I'm not even going to attempt to comment. It's hard enough with a touch keyboard as it is. 3. You probably don't even know you have it on, it's the default setting on Blogger. Make sure it's set to NO. Watch as the people rejoice. One other thing to make your comments a little more fun. While you're in that same section in the settings, you can create a personal note to your readers to let them know you like their comments. This box should not be abused with three paragraphs of text, I'm never going to read it. A simple sentence is more than sufficient to get your point across. Remember, when it comes to CAPTCHA just say NO! Also, occasionally Blogger will randomly switch your settings back to default (it's never happened to me, but it has to some bloggers I know), so it doesn't hurt to check those settings every once in a while to make sure all is as it should be. Louise is right - sometimes it switches back. Bummer it's the default setting. Most people don't even realize it's on. The worst are the blogs you don't think have it on, and it pops up when you hit publish. Grrrr. I didn't know it can switch back on. How annoying! Awwww yes. Computer robots making sure you aren't a computer robot. You've gotta love the irony. I too never realized it was on until someone mentioned it last week. And I would get irritated when I had to get past it on someone else's site. It took Blogger months to begin actually catching spam for me. Instead my blog was hammered by dozens of spammers daily, but it seems the algorithm has finally begun to catch up. I'd still rather selectively delete spam comments, though, than put my readers through CAPTCHA. In my eyes it's accidental discrimination against people with vision problems, and their comfort in commenting is more important to me than a couple of minutes of weeding out bots. I commented on blog recently that had captcha AND comment moderation - I think they were actively trying to put people off commenting! I still do comment mod, and I hope someone would tell me if the CAPTCHA comes on. Hopefully it hasn't been an issue. 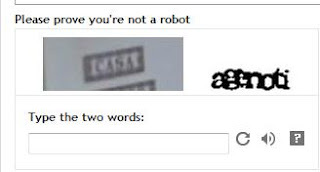 I agree I don't like the captchas either! They're such a pain. And I hadn't ever gotten the spammy comments until last month. On my crafty blog I started getting loads of anonymous comments that said really strange things. They were driving me absolutely nuts! So, I turned the captcha back on for awhile and they finally stopped. Yep, yep, yep. Your blog is my favorite in the A to Z Challenge so far! Totally didn't know about this! Thanks for the tip. I'm pretty sure mine is turned off, but I'm going to check just in case. Only a few of the blogs I follow still carry this thing. Most blogs I find with it I decide not to bother with if I don't really love the blog. The lucky few make my blogroll like your blog is about to. Can't believe I didn't add you before. So expect more comments from me more often. Great choice today J.A. Google recently stopped working in Chrome, so now when a captcha screen pops up, I have to copy and paste the url and open up Firefox so I can see the stupid catchas. Even worse is when there's comment moderation after all that fuss to figure out what those blurry things say. YES! This! I hate Captcha, and I didn't even know it was on!!!! Sometimes I hate blogger. Oh, and you have to check because blogger will randomly TURN IT BACK ON!!! But lately, I've been getting some funny captcha from other sites. The other day it gave me 404 Beiber. No really, Captcha couldn't find beiber... not that I mind. I've never really minded Captcha. I'm glad it catches Spam, because when I had it off, tons of ads started appearing in comments, even in earlier posts. I just don't get along well with Captcha. Its very irritating and half the time I get the alphabets and numbers wrong. We can't talk about the negativity of captcha enough. Some bloggers still have it on and it's so frustrating. Thanks for addressing this in such a good way. - keep clicking the circly arrow until you get one you can see easily - and never try the recording, that's just silly and has never worked. Amen, sister. Turn off your CAPTCHA. And take the time to leave thoughtful comments, not just hastily jotted words that mimic the comments before you. There is kind of an etiquette to the whole thing, I think. Sometimes I'd just rather someone didn't comment than show they didn't really read the post or at least give it a good skim. :) And yes, booo to captcha. This is the best blogging advice you can give. Thank you. I see that others already mentioned this, but blogger does, occasionally, turn it back on. So it is a good idea to check your settings from time to time. But how with they ever digitize all those words from old manuscripts? (Seriously, people used CAPTCHA for that). I'll tussle with the CAPTCHA if I REALLY want to say something, but otherwise, after the first or second failed attempt, I give up. Some are almost impossible for me to make out. Yes! I hates those things...seriously I can hardly see them and almost always get them wrong and then give up. I'm convinced that the CAPTCHA letters/numbers are deliberately skewed and twisted to trick us.... they are indecipherable! It's so annoying! Hi. I'm hopping through from IWSG. I'm guilty of having my word verification on. I do get spam when I turn it off, but in honor of your post I'm going to try removing it again. I'm going to have to visit you again. I like info like this. I didn't even realize I had my captcha on until a nice commentor informed me it might be better if I turned it off. I agree, I don't like to do it myself, especially when I can't tell what the letters or numbers are.